The band has an old but usable computer with Abel installed on it, donated by Ed Donnen and the Washington Ringing Society, and a set of four muffles that fit the light four (1234). This summer the band voted to buy a sensor setup, which arrived from England a few weeks ago. Now it’s time to get everything set up. Thomas started on this in earnest this week. The computer · The computer is an old Dell Inspiration laptop, disabled by Ed Donnen so that it won’t do anything but run ringing software and has no attractive pieces for anyone to steal. It sat in the bell tower unnoticed for several years. When I first started it up it failed to boot due to some internal power storage having run down. Ed said: either press F1 when it offers that choice and see if it works, or leave it plugged in for a few hours to charge everything back up. That worked. I’ve left it plugged in and on since, to make sure no further problems arise. Something to set the computer on · Computers don’t thrive or survive on the floor or stuffed in a corner, plus to use the simulator someone has to give commands to it. My wife and I had an IKEA kitchen cart and not enough space to move everything to Virginia, so we donated it to the tower as a computer stand. It’s the right size for the space and has enough area for the computer, some speakers, and the odds and ends of the sensor wiring. (8x) A reflector for each bell wheel, to give the optical sensor something to sense. (8x) An optical sensor for each bell. The sensor has a bright LED whose light the reflector can bounce back to the sensor’s receiver. (8x) A cable from each optical sensor to the next piece. The Multi-Bell Interface or MBI, a box with eight jacks for the cables from the optical sensor and one jack for the main cable down to the computer. The MBI multiplexes the sensor outputs onto one signal line, and probably does various other useful electronic tasks we need know nothing about. The main cable from the MBI to the computer. It carries the multiplexed sensor signals down, and also carries power up to run the MBI and sensors. The small power supply for the MBI and sensors. Someone had ordered a one-bell setup some years ago and the parts were still lying about the tower. We shipped those back to David Bagley, who makes the sensor setups, for a discount on the price of our setup. Everything arrived at the tower in July, where it waited until I had time to install it. Bell silencers or muffles · My original plan was to construct a frame for each bell that fits in its mouth and around its clapper, preventing the clapper from swinging and thus the bell from sounding. But moving troubles got in the way, and I never had time to make them. The backup plan is to use the four muffles Ed Donnen made for the tower some years back. These are sections of motorcycle tire that fit over a clapper. Each has two flaps cut in it to let the clapper through and hold the muffle in place on the clapper. If the tower finds it needs to run the simulation with more than four ringers, perhaps Ed will make more muffles for them. a table of time delays for each bell to accommodate its natural period of swinging. When everything is set up properly, each time a bell swings, its optical sensor detects the motion and sends a signal to the computer and Abel. Abel waits the appropriate time delay and then plays an appropriate recorded bell sound. Why is this desirable? First, because the Miami tower tries to accommodate its neighbors and limit the amount of ringing they hear. The simulator setup lets the ringers silence or muffle the bells, so the neighbors don’t hear anything, yet hear the simulated sounds that their ringing would have produced. Thus the band can practice more often and longer. Second, because the simulator can fill in bells that there are not ringers for. In the past the band has often suffered from low attendance, with not enough ringers present to do anything. The simulator can be set up to fill in bells for which there are no ringers, and sound each of those bells when a skilled ringer would have sounded it. Using it a few ringers can work on Rounds, or Plain Hunt on any number of bells, or Plain Bob or more complex methods. The band’s members vary in ambition and skill, like any band, and the simulator allows ambitious ringers to learn methods that the tower can’t provide a band for. And finally, because the simulated bells strike exactly where they should be striking, enabling ringers who want to improve their striking above the band’s level to work as if surrounded by a band of skilled ringers. In that context, any bell that strikes out of place is much more obvious, and it’s always clear which ringer was in error since the simulated bells are never out of place. 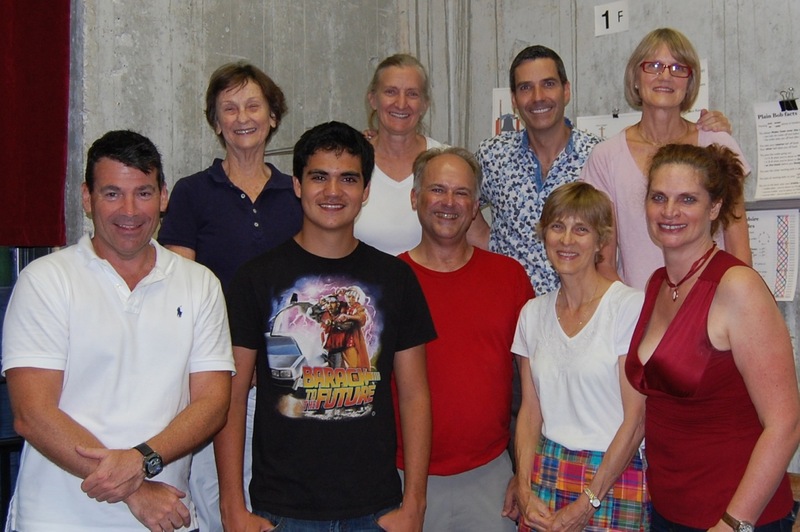 Ten ringers: Anne, Barbara, Eoin, Jim, Jorge, Judy, Lynn, Marguerite, Rob, Thomas. This was Jorge’s first time ringing in a band. Barbara’s son and Eoin’s brother Liam sat quietly. We raised all eight 12345678. The largest number of ringers to attend practice in the last two years (and perhaps, ever) attended tonight’s practice; no one wanted to miss the last opportunity to ring with their teacher/tower captain who would be saying goodby to Miami after a two-year stint. Raised 12345 in peal, then 6, 7, and 8 individually. Call Changes. We attempted the 36 Changes but that was far too ambitious; instead we rang to Queens and back, which was probably also too ambitious. Rang 12345 down in peal, then 678 in peal. One of the most heartening things about the rejuvenated Miami band is how much time they spend laughing together. This bodes well for the band’s future. Afterwards much of the band adjourned to a newly discovered pub next door to send Thomas off with toasts of gratitude and good wishes for his next steps. Anne also contributed to this post. Jorge · Worked on raising, good ringing form, and setting on demand. Don’t push out on the handstroke. Thomas checked the alignment of the clappers of the 3 and 6 and realigned the 3’s clapper. These had worked loose and been spotted on 2013Aug13Tu and quickly realigned and tightened by Bobbie and Thomas, but we hadn’t had a tape measure and were pretty sure at least the 3 was not aligned correctly. Thomas brought a tape measure today (and donated it to the tower) and using it aligned the 3’s clapper properly and confirmed that the 6’s had been properly aligned last week. Bobbie and Thomas made a routine check of the bells before practice and found two loose wheel nuts (#1 and #5) and, much more seriously, two loose staple bolts whose clappers could no longer be kept swinging true (#3 and #6). Each staple bolt is secured by two nuts, the lower of which holds the staple bolt (and thus the clapper) in place and the upper of which acts as a lock nut keeping the lower from loosening. In both cases the lower nut had frozen in place, especially on the 3, and we first had to work it loose in order to be able to tighten it. This took about ten minutes of back-and-forth with the 25mm wrench for the 3. They need to be loosened and spun off, with the staple bolt and clapper supported by the staple bolt stand Thomas built for sawing off the 5’s lower staple bolt nut that had frozen in place. Once spun off, the threads of the bolt and nut need to be brushed and wiped clean, coated lightly with lithium grease, then worked easy by spinning the nut up and down until the grease is spread and any roughness or corrosion is worked out. Then each clapper can be realigned and the nuts tightened up again.